정부가 절대빈곤층으로 인정하여 생계비, 교육비, 의료비 등을 지원하는 생활보호대상자는 전체 서울시민의 1.8% 수준이며, 2000년 현재 약 18만명에 이르고 있다. 이들은 대개 자신이나 친지의 힘으로는 생계를 유지할 수 없는 노인이나 모자가정, 소년소녀가장이 주를 이룬다. 생활보호대상자의 분포를 보면 노원구 상계동, 월계동, 중랑구 신내동, 강남구 일원동, 강서구 방화동, 등촌동 일대에 집중 분포하고 있는데, 이는 과거 산동네가 영구임대주택단지로 재개발되면서 이들 지역이 저소득층의 주된 거주지가 되었기 때문이다. 복지적 측면에서 집중된 저소득층 거주지역을 일반지역과 사회∙경제적으로 통합하고 적절한 복지서비스와 자활지원 프로그램을 제공하는 것이 주요과제이다. 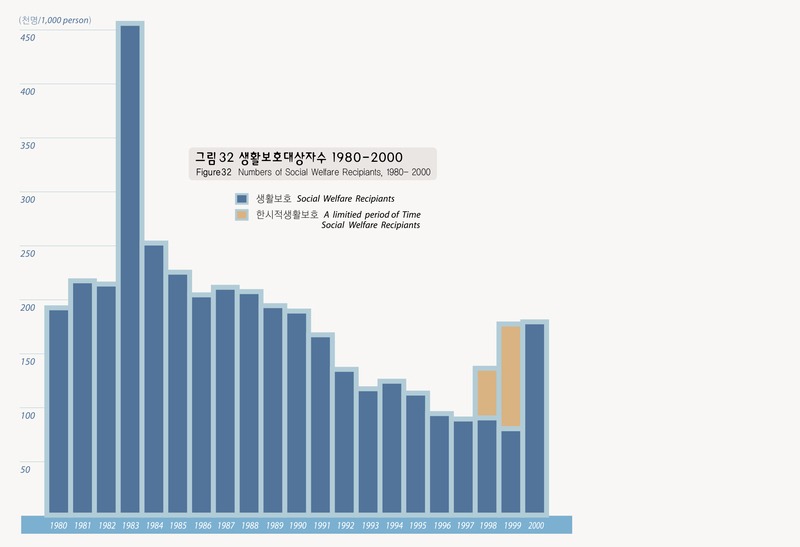 The social welfare recipiants whom the government acknowledged as those who are in absolute poverty and should be provided a minimum living expenses, education expenses, medical expenses and others constitutes 1.8% of the Seoul population, 180,000 people as of the year 2000. They are the people who cannot support themselves on their own such as the elderly, single parent families, and boys and girls who are head of families. The social welfare recipiants live mostly in Sanggye-dong and Wolgye-dong in Nowon-gu, Sinnae-dong in Jungnang-gu, Ilwon-dong in Gangnam-gu, Panghwa-dong and Dungchondong in Gangso-gu. It is because that in the past permanent rental houses, and complexes have been developed in the mountain areas of those regions and many of low income have come to live there. From the welfare perspective, it is considered a matter of significance that the low-income brackets' residences shall be incorporated, both socially and economically, into other regions and that appropriate level of welfare services and selfhelp programs be offered to them.